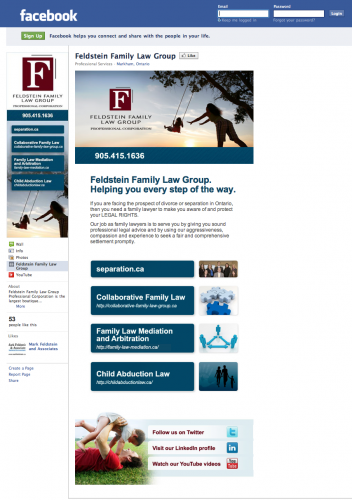 Feldstein Family Law Group is one of Ontario’s largest boutique family law practices and maintains a significant online presence, including its newly-revamped flagship website www.separation.ca , subject-specific sites for family law mediation, collaborative family law, and child abduction law, and blogs on both Ontario case law as well as celebrity divorce matters. Skunkworks has recently partnered with Feldstein Family Law Group to help extend this online leadership position into the world of social media. On the facebook front, the firm has recently launched its facebook company page (shown below), including a custom landing page for first-time visitors to the site. Over on Linkedin, the capabilities of company pages have recently been expanded and we have created detailed services pages that capitalize on this improved functionality to visually demonstrate the full range of services Feldstein Family Law Group offers to its clients. 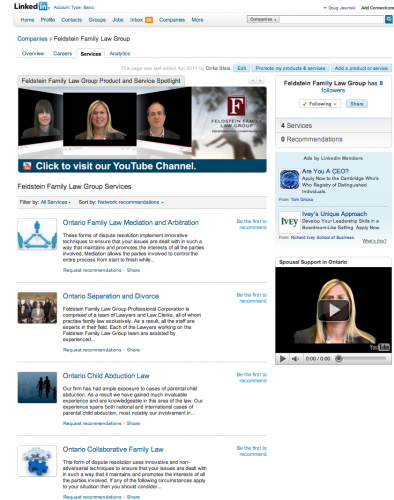 Managing Partner Andrew Feldstein is also active on Twitter, and the firm has its own YouTube channel where they are now providing frequent video-blog updates on a variety of Ontario family law matters. Currently, many law firms online presence starts and stops at their firm website. Feldstein Family Law Group takes a different approach that is representative of where we believe sophisticated online legal marketing is headed, with a comprehensive array of sites and formats that bring original content out to the many places online where the firm’s clients, potential clients, and other stakeholders spend time or seek out law-related information, and we are pleased to be part of the team helping to make it happen.